Styled in modern décor and crisp cream linens, each room features warm earth tones and modern marble counters in the private bathroom. 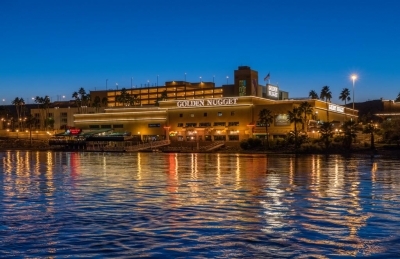 Each guest room provides a flat-screen cable TV and free toiletries at the Golden Nugget Laughlin. Perched on the river, Saltgrass Steakhouse features fresh steaks with full bodied smokehouse flavor at Laughlin Golden Nugget. Bubba Gump Shrimp Co. features delectable seafood with a classic American twist.